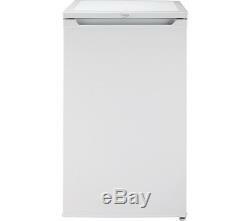 BEKO UL483APW Undercounter Fridge A+ Auto defrost White. Kitchen Appliances > Refrigeration > Fridges. Brand new & pristine product. Top features: - Keeping food fresh with an antibacterial seal - Versatile storage for all of your chilled goods Keeping food fresh Preventing bacteria from forming and entering the fridge, the UL483APW has an antibacterial seal around the door to ensure your groceries look and taste great. At the bottom of the fridge, a large salad crisper drawer allows you to keep fresh fruit, bags of salad and vegetables fresh and crisp for as long as possible. Versatile storage For flexible storage, you can adjust the interior glass shelves to suit your needs. If you want to refrigerate a particularly tall item, simply move the shelves to a different level. To ensure your fridge doesn't get built up with frost and ice, the UL483APW automatically removes any ice formation on the back wall. Featuring easy to clean shelves, a spacious salad crisper and a large drinks storage space in the door, the Beko UL483APW Undercounter Fridge has a range of storage options for every home. Do not use it in any unheated area. Reversible door hinges: This appliance has a reversible door. Please consult our Knowhow team or a qualified installation expert to carry out door reversal - select the door reversal service when you add this product to the basket. All Currys/PC World Outlet guarantees are non-transferable. 82 x 47.5 x 53 cm (H x W x D). Annual energy consumption: 113 kWh. Type of door handle: Integrated. Optimum ambient temperature range: 10 , 43Â°C. Noise level: 40 dB(A). Colour / Finish: Gloss white. Fridge gross capacity: 90 litres. Door: Reversible door , hinged on right. Please consult our Knowhow team or a qualified installation expert to carry out door reversal , select door reversal service when adding product to basket. Recommended installation space: 25 mm to the sides, 30 mm above, 30 mm behind. Box contents: Beko UL483APW Undercounter Fridge, Egg rack x 1. Dimensions: 820 x 475 x 530 mm (H x W x D). Boxed dimensions: 880 x 510 x 530 mm (H x W x D). This product has no reviews yet, however see what our buyers say about our other products.. The right of cancellation does not apply in the following circumstances. When the product seal has been broken on any DVDs, CDs, memory cards or software, including games - On any personal hygiene products such as shavers, hair care products - On headphones, where the seal on the packaging is broken - If you want to return a Software Product Activation Key card which is not faulty, the silver strip on the back of the card must be fully intact as new. Complete the Reason for Return note that came with your parcel & include it in the parcel with your return. You received an incorrect item - you received a damaged item - you received a faulty item. Can a Currys or PC World retail store help? Reassuring 12 month guarantee on all products. The item "BEKO UL483APW Undercounter Fridge A+ Auto defrost White" is in sale since Wednesday, May 17, 2017. This item is in the category "Home, Furniture & DIY\Appliances\Fridges & Freezers\Fridges". The seller is "currys_pcworld" and is located in Newark. This item can be shipped to United Kingdom.